The cities of Meycauayan in Bulacan and Valenzuela in the National Capital Region joined forces to clean the river passing through their area. The two city governments tackled river declogging by removing water lilies and preventing trash buildup in the waters. Two back hoes were deployed to remove the river-clogging pants and to facilitate the healthy flow of the river. The same equipment were used to remove water waste that have accumulated deep into the river. 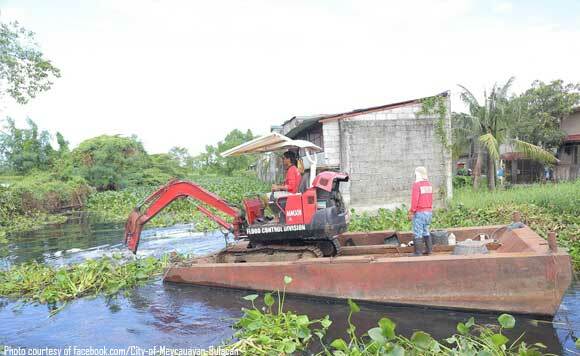 Deputy Speaker Linabelle Ruth R. Villarica also donated an amphibious excavator to aid in the river declogging. The local government units initiated the program as a solution to flooding, especially in the areas near the Longos-Bayugo and Bancal creeks. The joint clean-up drive (Dredging/Declogging of the Creekside) is being implemented under the Office of Meycauayan Mayor Henry Villarica and the Valenzuela Cleaning Operation Task Force under Valenzuela City Mayor Rex Gatchalian. The project was launched in November 27, 2017, and will run until April this year.